This is a sponsored post written by me in conjunction with Leah Segedie's book release. 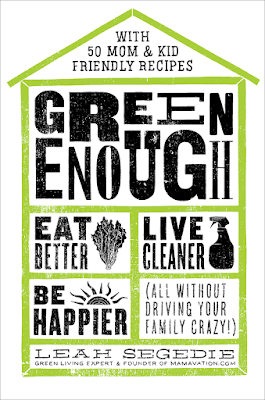 When my blogging friend Leah Segedie excitedly shared that her book - Green Enough: Eat Better, Live Cleaner, Be Happier (All Without Driving Your Family Crazy! )* - was on its way, I was thrilled. Though I haven't gotten mine yet (it is available tomorrow, March 20th!! ), I was able to take part in a sneak preview event on Twitter as a panelist, connect with others who are helping celebrate the release, and got to take a look at a few excerpts. As soon as I get my hands on the actual book, I'll do a full review, but I wanted to share this information as soon as possible. I love the concept of this book. Yes, we all know we need to be more vigilant about what we put in our mouths; we all know we need to reduce plastics and chemicals in our households. I love that this book, while soap-boxy (and I use that as a compliment, not a critque), isn't about guilt. Segedie encourages slow, gradual change. "Think of it like flexitarian, but less regimented—more flex, less tarian," she writes. It doesn't have to be all or nothing. It's about the changes you can make in your own life that will make a difference in the long run. That is a soap-box I can stand on! In case you don't know Leah Segedie, she's the blogger behind Mamavation. You can connect to her on Facebook, on Twitter, on Instagram, on Pinterest, and on Google+. Artificial food dyes are found in beverages, ice cream and various frozen desserts, cake and candy, macaroni and cheese, and medicines (I’m point-ing at you, Pedialyte Powder in Fruit Punch flavor). Bear in mind that artificial color can crop up where you wouldn’t tend to expect it. For example, in a chocolate cake with white frosting, the cake will often con-tain a combination of dyes used to create a nice chocolaty brown (espe-cially if the ingredients don’t involve much in the way of real chocolate or cocoa in), and blue dye can be used to make white icing appear bright." Reprinted from Green Enough by Leah Segedie. Copyright ©2018 by Leah Segedie. By permission of Rodale Books, a division of Penguin Random House LLC. Available wherever books are sold. For the most part, I already avoid artificial colors. But have you ever wondered why we dye Easter eggs? Oddly, I never have. As a parent, every Easter, I would purchase one of those dying kits - with its plastic buckets, wire dippers, magical tablets that dissolve in water and vinegar - lay out newspaper, clad the boys in already stained clothing, and create a dozen or so eggs dyed in hues not normally seen in nature. But I never asked "what's the story behind the dyed eggs?" Why do we do this every year? 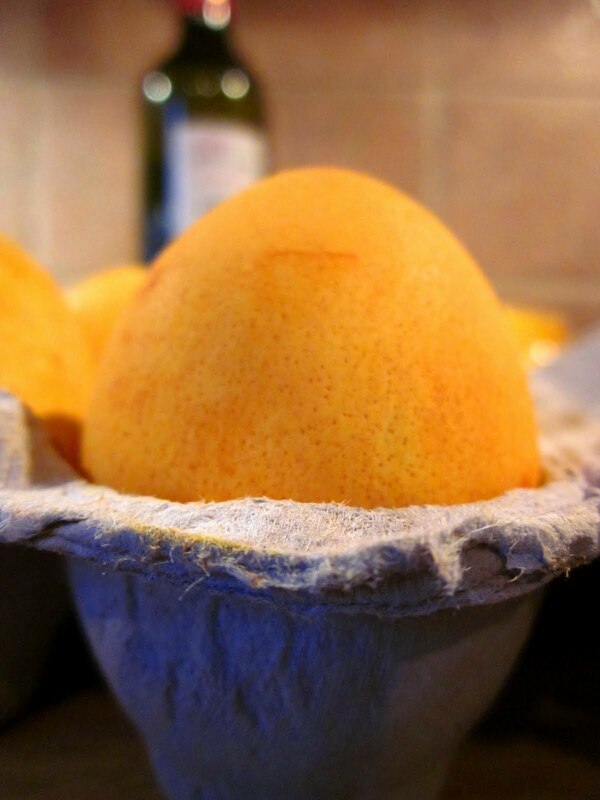 We don't hide these eggs; these are the ones we dye - just for the experience of dying them - we refrigerate then for a day or two, and then make them into a boatload of egg salad for sandwiches. I decided two things this year: (1) I wanted to know why we dye eggs at Easter and (2) I was done buying those kits. 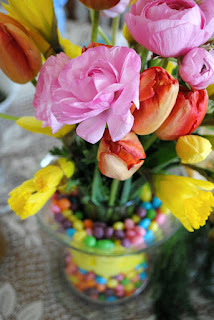 I remember my mom dying eggs with natural foods. So, I looked up different foods that are used to naturally dye fabrics. That launched me down this culinary adventure - dying our Easter eggs with things found in my kitchen. From my research, the tradition of dying eggs predates Christianity and, thus, Easter. 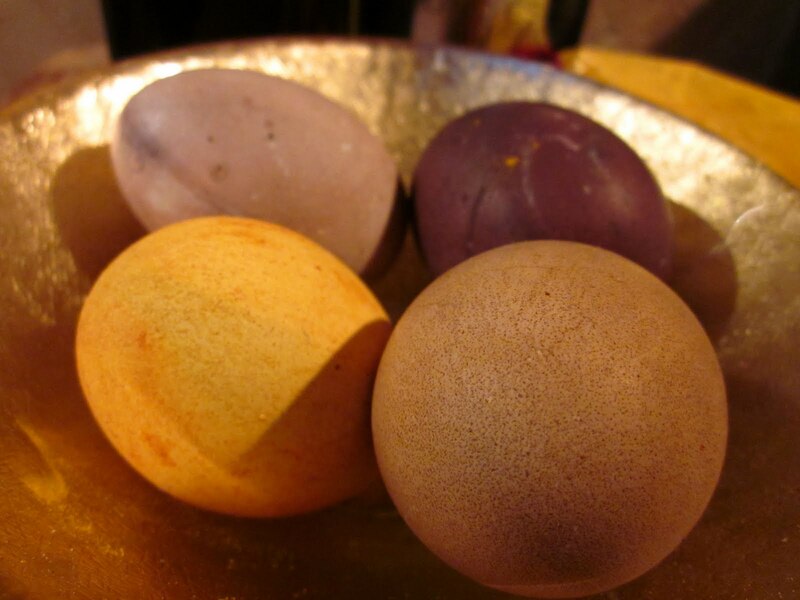 Ancient Greeks, Romans, and Persians dyed eggs to celebrate Spring; green was commonly used to represent the new foliage emerging after the long winter. The tradition, originally pagan, was absorbed by early Christians who dyed their eggs red as a symbol of Christ's blood. For yellow...in a pot I whisked 1/4 cup of turmeric with water. Then I placed the raw eggs gently into the pot and added water till they were completely submerged. I brought the liquid and eggs to a boil, letting them boil for 10 minutes. Then I cooled them completely in the liquid. 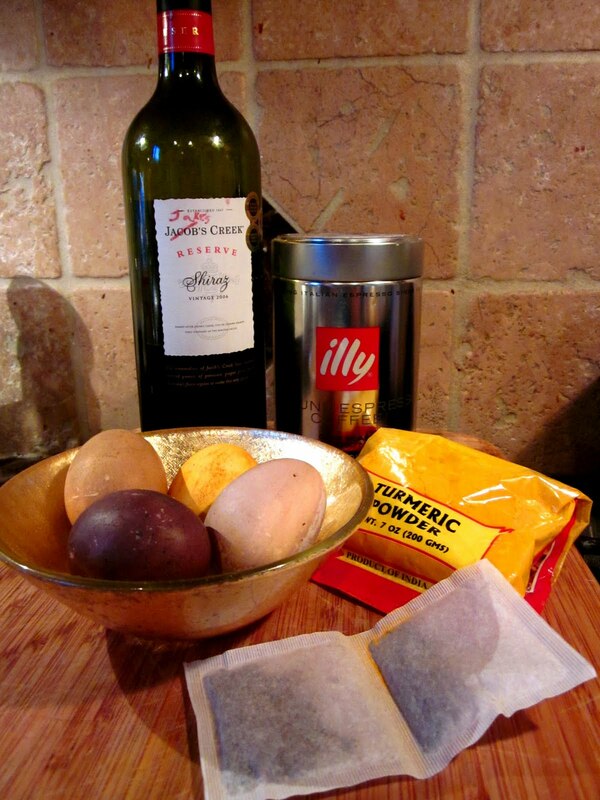 I did the same with a hibiscus tea, hoping for pink eggs. The resulting eggs were more taupe, a tan color with a pinkish hue. Still pretty, but not what I wanted. I simmered eggs in cold espresso for an earthy brown. 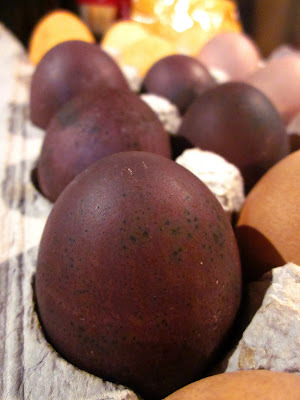 But my favorite kitchen-dyed egg resulted from eggs cooked in leftover wine. Regal syrah colored eggs. Gorgeous. Being a parent requires compromise. I've learned this over the years. 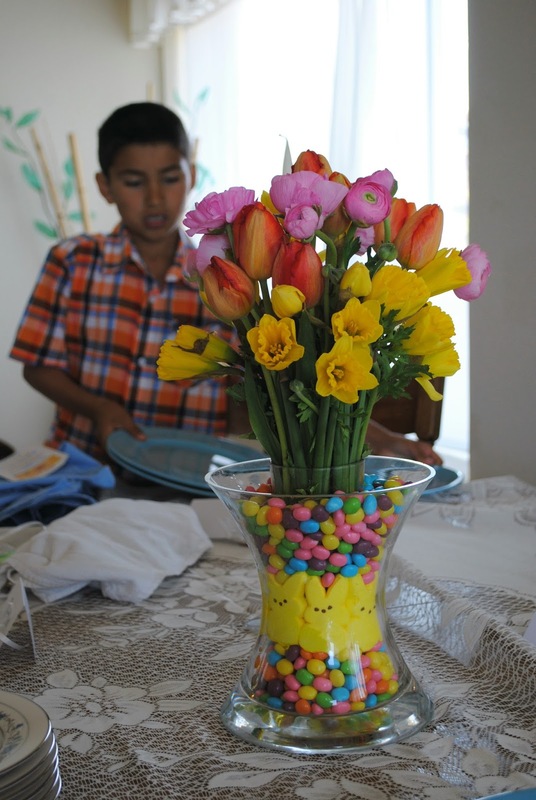 And one of the things I've learned to do so that my kids aren't completely sheltered from Easter candies such as PEEPs: we buy them, but we don't eat them! And they make fantastic bases for placecards! Baby steps. Are there steps you've made to green your life? If you need a nudge, Segedie's book is a great place to start.